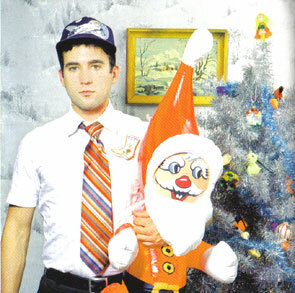 Sufjan Stevens has never been one to shy away from the big projects. His earliest musical endeavours included concept ‘albums’ about The Nine Planets and The 12 Apostles, while his second album, ‘Enjoy Your Rabbit’, was a suite of symphonic songs about the Chinese Zodiac. And, of course, there is the 50 states project, an epic undertaking, which should keep him busy well into the second half of the century. It seems only natural, therefore, that he should collect a series of Christmas songs, produced for family and friends over a period of six years, and issue them in a five disc box set, together with songbook, comic, essays, stickers and other goodies. In one of the accompanying essays, Stevens hilariously describes the dysfunctional family Christmases of his childhood, and confesses that this project has been a way of rediscovering both the good and the bad about the holiday season. For us, it serves another purpose, as the five discs, originally conceived as individual EPs, were recorded (apart from 2004) on an annual basis, and allow us to chart the artist’s progression from folksy guitarist to chamber-pop genius. There are 42 songs here, from traditional Christmas carols and instrumental favourites to quirky pop tunes and silly seasonal sing-a-longs. Those familiar with Stevens’ treatment of tribute album contributions and cover-tunes will know he is likely to bring freshness to whatever he touches, and that is certainly the case here. One such highlight of the earlier discs is ‘What Child Is This Anyway?’ while the usually cringe worthy ‘Little Drummer Boy’ is substantially transformed. It’s an eclectic bunch of songs, with highlights dotted across all five discs, but it is probably the most recent two that feature the real treasures. ‘It’s Christmas Time’, with its layers of fuzzed-up guitars, is the least Christmas-sounding song on the set, but among the best. Later on the same disc, Stevens asks ‘Did I Make You Cry On Christmas? (Well, You Deserved It!) – a deliciously comic (and quite moving) take on the awful holidays of his youth. Disc five, recorded just this year, contains six Stevens originals, the best of which would not be out of place on ‘Illinois’ or ‘The Avalanche’. The organ-filled ‘Get Behind Me, Santa!’ gets the nod for the silliest song on the set, with some hilariously irreverent Christmas lyrics, but both ‘Jupiter Winter’ and ‘Sister Winter’ are gorgeously melancholic. ‘Star Of Wonder’ is similarly beautiful, a swirling rush of organ and woodwinds. That Stevens is able to bring so much to what could be considered a somewhat slight project is a testament to his talent as a songwriter and arranger/producer. It could be argued that one could distill the best of this collection into one particularly fine album, but I think that would be missing the point. ‘Songs for Christmas’ is about the whole lousy, wonderful, stupid, heartwarming, saddening experience we know as Christmas, with its excesses, tackiness and (yes) its beautiful moments.